or click here to go directly to pricing for Medicare supplements. You can sign up for Medicare beginning three months before you turn 65, and coverage can start as soon as the first day of your birthday month. The initial enrollment period lasts until three months after your 65th birthday. If you fail to sign up during this seven-month window around your 65th birthday, you may be required to pay permanently higher premiums for late enrollment. ​There is a one-time Medigap open-enrollment period that starts the month you turn 65 and enroll in Part B and lasts six months. During this period, you have a guaranteed right to buy any Medigap policy sold in your state regardless of your health condition. After this period, you could be denied coverage or pay higher premiums. 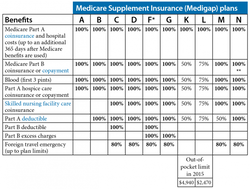 A Medigap policy gives some peace of mind that those expenses will be covered if you have very high medical expenses. ​These plans fill in many of Medicare's cost-sharing requirements and sometimes cover additional services that traditional Medicare doesn't cover. Clear and simple information in short videos about Medicare. Click here to get a quote or scroll down for videos. * There is also a high-deductible version of Plan F where beneficiaries pay a deductible of $2,180 in 2016 before the Medigap plan begins to cover costs. ** After the out-of-pocket limit (including the Medicare Part B deductible) is reached for Plans K or L, the Medigap plan pays 100% of covered services for the remainder of the calendar year. ***Plan N pays 100% of the Medicare Part B coinsurance costs, with the exception of a co-payment of up to $20 for some office visits and up to $50 for emergency room visits that don't result in the beneficiary being admitted as an inpatient.